The synthetic turf pros at Watersavers Turf are sometimes asked if we carry artificial grass for disc golf? We do! You may not know that disc golf is a sport that has evolved over the years. In fact, it’s not a new sport at all. While many people are only recently hearing about this activity, it has been around for decades. Today, artificial grass improves disc golf by offering a faux sports field that can be played on all year round. In case, you haven’t heard of disc golf, here’s a little history. It was a California golfer who invented disc golf in 1965. His name was George Sappenfield, and he created a game played with Frisbees for his children to enjoy. It was loosely based on golf and involved hitting a series of targets. The man who is now known as the father of disc golf was named Ed (“Steady Ed”) Headrick. Ed created and patented the Frisbee ™ while at Wham-O Toys. He’s also the guy who created the first official course for disc golf and made it into a competitive sport. The game has continued to grow and improve since that time. 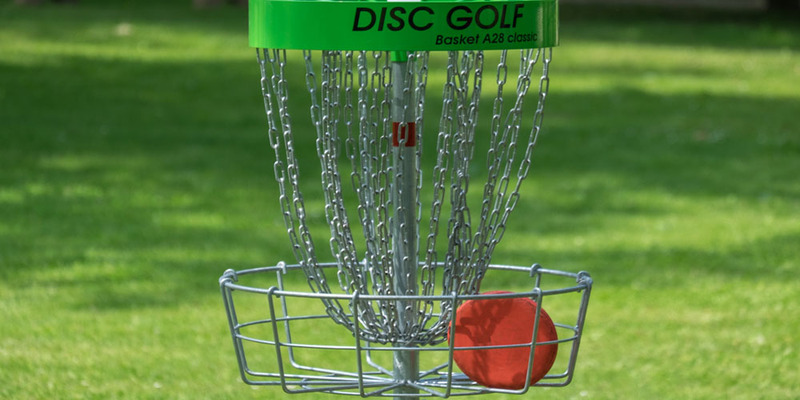 Today, artificial grass has improved disc golf so that it has become a very popular activity. It has official rules, and new courses have been springing up everywhere. Like traditional golf, the courses for disc golf are located outside. However, synthetic turf is often used on the courses’ tee boxes. We’ll explain what those are shortly. People are sometimes puzzled by how artificial sports turf benefits golf and other outdoor sports. They wonder what could be better than real grass? It turns out that there are many ways that artificial sports turf benefits golf. Football, baseball, soccer, and tennis now use it, to the benefit of both players and fans. Exactly how artificial sports turf benefits golf was shown in California during the recent water drought. People saw huge amounts of water that natural grass golf courses use up. Synthetic turf needs no water at all. This made everyone more open to the idea of using sports turf in more places. After all, it has been used for major league sports fields for many years. Schools and colleges are using it more often, too. So golf courses can really benefit from using artificial sports turf, and more of them are now doing that. Some courses are using it only on their greens and tees. However, one man in Tasmania has created an entire 18-hole course with it! In the sport of disc golf, artificial turf creates the best tee pads. What is a tee pad? It’s actually the surface that the player stands on within the tee box. From this area, a player throws his disc, similar to the way that a golfer tees off. Course designers have found that artificial turf creates the best tee pads. Installed over concrete or hard-packed soil surface, it drains well. It stands up to harsh weather. It can be used with padding underneath. Plus, it provides a stable and level surface for the players, who seem to agree that artificial turf creates the best tee pads. Creating a course does not have to be costly. The game is played on both 9-hole and 18-hole courses and can be enjoyed by men, women, and children of all ages. People are forming clubs and working together to create and maintain their courses. As they are learning the rules of the game, they are also learning about the benefits of using man-made grass. The playful side of synthetic grass can be seen at an 18-hole disc golf course in Tennessee called The Claytons. It covers about 220 acres and features artificial sports turf covering its concrete tee pads. Among other things, the course is a prime example of game’s growing popularity. The Claytons is open from dawn to dusk. People can just show up with their equipment and play; no tee time is needed. More and more communities are warming up to the idea of parks like these because residents want them. It’s a sport that the entire family can enjoy and that any family can afford. It gets people outdoors, and it gets them active. Enjoying life more is what synthetic grass is all about. Today’s options, of which there are many, look real and feel great. It’s being used in athletic fields and other sports venues. Synthetic grass is also showing up in people’s yards. They are using it for putting greens, bocce courts, tennis courts, and more. People are using it around their pools and patios for year-round enjoyment. It’s also very easy to care for compared to a natural lawn. There’s no watering, mowing, weeding, or feeding required. That means you’ll have a lot more time for your playful side. When you want to learn all about any sport, the best way is from the pros. When you want to learn more about using artificial sod, talk to the pros at Watersavers Turf. We’ve made it very easy for you to do that. You can call us at 844-974-8873, and you can chat with us online. We’ll be happy to answer any questions that you have about using artificial sod. If you want to take a close look at today’s turf products, please visit us at any of our SF Bay Area locations. Pick up some of our free 1’ x 1’ samples and take them home with you. When you check them out, you’ll see just how real today’s turf options look. Artificial sod products are being used all over the US. Its place in the world of sports is only one of the reasons. People keep coming up with new reasons all the time.